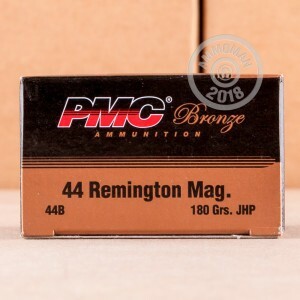 This .44 Magnum ammunition from PMC is equally suited to hunting, defense, and target shooting. It fires a 180 grain jacketed hollow point bullet at an impressive muzzle velocity of 1,750 feet per second, delivering good accuracy when fired from a revolver and even better accuracy from a long gun. 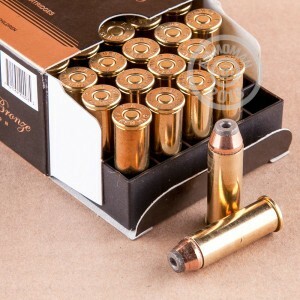 These cartridges come packed in a case of 500, which contains 20 boxes of 25 rounds each. 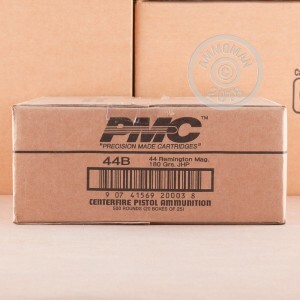 PMC ammunition is made in South Korea by a major defense contractor and uses non-corrosive Boxer primers and brass cases. Pick up this 500 round case to instantly qualify for FREE shipping from AmmoMan.com. That means you pay only the list price, with no shipping calculator to mess with and no surprise charges tacked on at checkout.